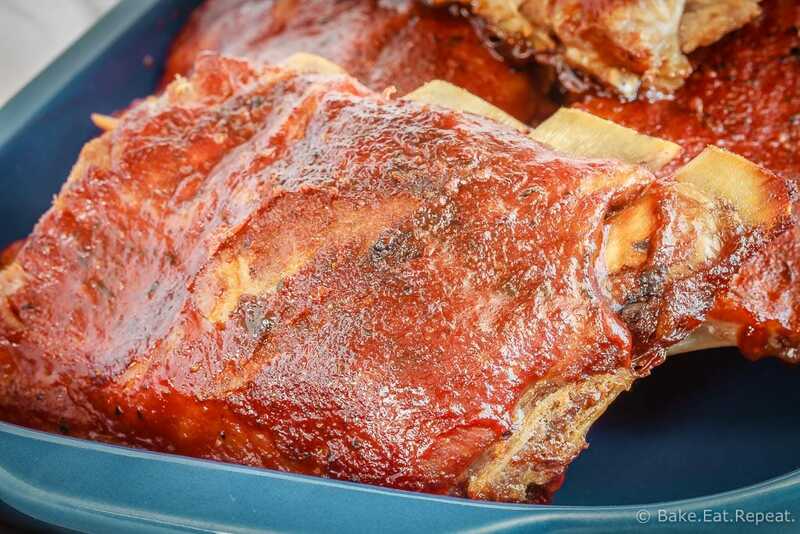 These oven baked ribs are my favourite way to prepare ribs – full of flavour, one of the easiest meals to make, and the whole family goes crazy for them! These oven baked ribs. They’re just amazing – that’s really all I can say about them. Well, not really all. I can always find more things to say about really good food. We all know that. But I don’t really have to say much more, because they are amazing. So you should just scroll right to the recipe, go pick up some ribs, and make these as soon as possible! I found this recipe about 4 years ago (five?) and after changing a few things to make them work for us (not using Old Bay seasoning in the dry rub for one, since I’ve never seen that anywhere and don’t even really know what it is! ), I haven’t branched out and tried any other recipes for ribs since. They’re that good. Every now and then, when they’re on sale, I buy the boxed ribs instead. You know the ones – pre-cooked, a slab of ribs in the box, all you really have to do is heat them up? 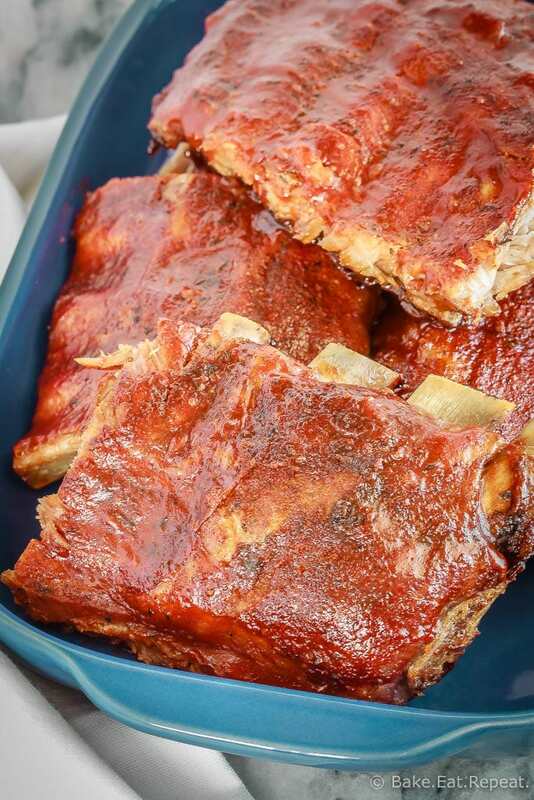 And those are great, don’t get me wrong – they’re a fantastic, easy and delicious way to enjoy ribs. But this summer we had those one week and the next weekend I made these again – and these oven baked ribs were the clear winner. And they’re not even a whole lot harder to make. It literally takes about 10 minutes to mix up the dry rub (with ingredients you likely already have on hand) and get the meat ready for the oven. As long as you plan ahead a little to let them sit with that dry rub on for 8-48 hours, the actual cooking process involves putting the pan with the foil wrapped ribs in the oven. And then broiling or grilling with some BBQ sauce before eating. That’s it. So easy, and so tasty. Seriously – go get some ribs and make these. I kinda want to throw them on the menu plan (again!) for this week now after talking about them! These oven baked ribs are my favourite way to prepare ribs - full of flavour, one of the easiest meals to make, and the whole family goes crazy for them! In a small bowl, stir together the brown sugar, salt, chili powder, black pepper, cayenne pepper, paprika, thyme, onion powder and garlic powder until well combined. Line a rimmed baking sheet with a double layer of aluminum foil (or one layer of heavy duty foil) and place the ribs on top. Sprinkle the dry rub over both sides of the ribs, rubbing it into the meat and making sure it’s completely covered. Turn them so they are bone side down and wrap them tightly in the foil. Refrigerate for 8-48 hours. Preheat the oven to 300 degrees F. Place the baking sheet with the foil wrapped ribs in the oven and bake for 2 1/2 to 3 hours, or until the meat is tender. Open up the foil and brush the ribs with BBQ sauce. Broil for 3-4 minutes, or until the sauce is bubbling. I like to flip them once or twice, adding more BBQ sauce and broiling each time. You can also grill them while adding the sauce if you like, although they do sometimes fall apart a bit so broiling is a bit easier to do. You can broil or grill these after they’re cooked, I usually broil just because it’s quicker and easier, but both options are great. It is sometimes a bit tricky grilling because the meat is usually falling off the bones at that point. 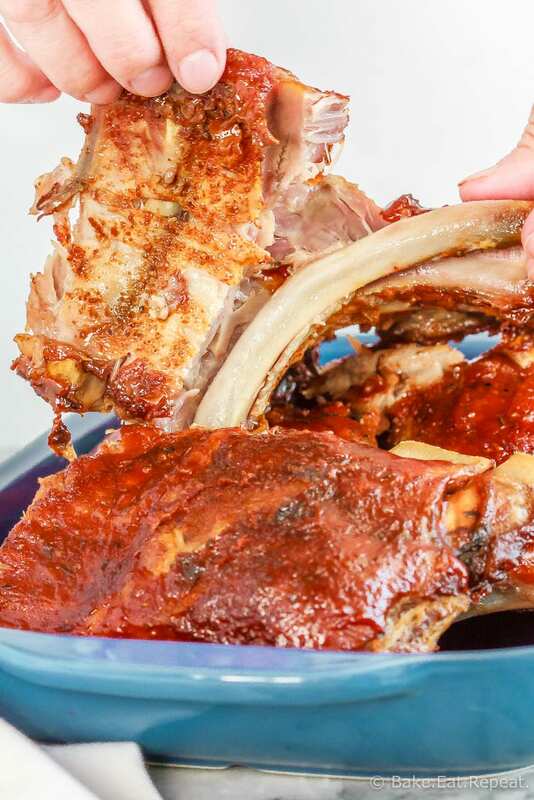 I’ve used both baby back and side ribs for this recipe - baby back is better, but side ribs are generally cheaper and this recipe is a great one to use for them. There is often a silver skin on the back of the ribs (not always, I find sometimes it is already removed) - it’s a very thin membrane that pulls off quite easily once you get it started. If that skin is there you should try to remove it as the ribs will be much more tender if you do. If you don’t like spicy food I would recommend not using the cayenne pepper in the rub. They will still be fantastic, just without the heat that the cayenne brings. I typically use less or none at all because my kids are much happier without it....although my husband and I like it better with the heat! Also, the recipe mentions refrigerating the ribs with the dry rub on them for a minimum of 8 hours. They are definitely better if you do this (more flavour) but I have many times not planned properly and forgotten this and they’ve only had a couple hours in the fridge and they are still fantastic. So....try to plan properly, but if you don’t, they’ll still be pretty terrific ribs! I am a black women who has been doing ribs since I was little. THESE ARE THE BEST EVER, I MEAN THIS FROM MY HEART! Welcome my sista, to the neighborhood! Just good food! 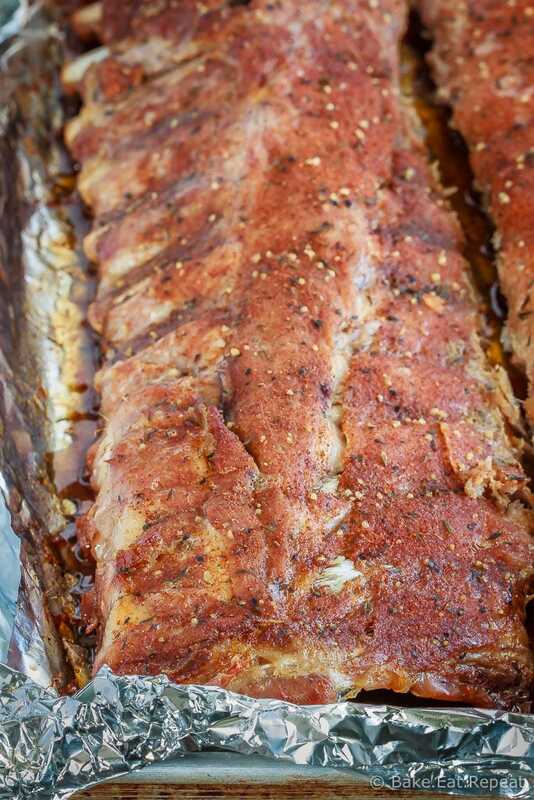 The spice rub on these baked ribs seriously sounds SO unbelievably flavorful, Stacey! I'm definitely putting these winners on my dinner menu!